The first customers are now taking delivery of the SL 65 AMG worldwide. The exclusive, top-of-the-range V12 Roadster, with a maximum output of 463 kW (630 hp) and maximum torque of 1000 Nm, will also be available for initial test drives. “The combination of exclusive V12 dynamism and refined roadster driving experience is unique. We are convinced that, with the new SL 65 AMG, we are able to offer an incomparably exciting high-performance vehicle for the small, but loyal community of fans”, according to Ola Källenius, CEO of Mercedes-AMG GmbH. As an alternative to the classic vehicle delivery method at dealerships and authorized agents of Mercedes-Benz, customers can also take receipt of their SL 65 AMG direct from the AMG Customer Center in Affalterbach. When collecting their vehicle in this way, customers are able to gain an exclusive insight into the world of AMG and also experience the excellent quality of customer care which is typical of AMG: after being welcomed by a personal customer service attendant, and treated to some hospitality in the AMG Private Lounge which was opened in 2011, they are taken on a tour of the plant. This also includes a visit to the AMG Performance Studio, where individual and one-off AMG vehicles are developed and produced by hand in limited numbers. In the AMG engine production facility, AMG customers have the unique opportunity to meet the engineers who have produced the V12 engine used in their SL 65 AMG by hand, in accordance with the traditional philosophy of “one man, one engine”. The AMG 6.0-litre V12 biturbo engine develops a maximum output of 463 kW (630 hp) and maximum torque of 1000 Nm. The unrivaled performance figures of the SL 65 AMG translate into an exceptional driving experience: acceleration from 0 to 100 km/h takes 4 seconds, with the 200 km/h mark being attained after just 11.8 seconds. The top speed is 250 km/h (electronically limited). 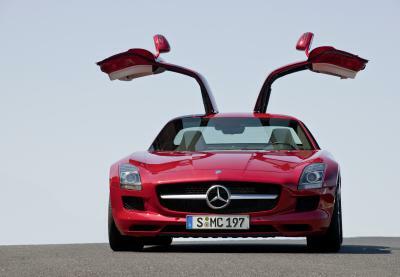 As with the SLS AMG super sports car, the use of an all-aluminum bodyshell results in a drastic reduction in weight. The new SL 65 AMG is some 170 kilograms lighter than before. The boot lid also helps to further trim the weight. For the first time on a mass-produced model, the internal support is made from lightweight carbon-fiber composite material. An important aspect of the new model is the intelligent lightweight construction which also contributes to reducing the fuel consumption: at 11.6 liters per 100 km (NEDC combined), it represents a saving of 2.4 liters or 17 percent compared with the preceding model, and establishes a new benchmark in the twelve-cylinder petrol engine segment. Mercedes-AMG also makes systematic use of lightweight construction principles, as well as numerous axle components made of aluminum, for the suspension. As standard, the SL 65 AMG comes fitted with the AMG sports suspension, based on Active Body Control. The design and appointments are also exceptional and exclusive: the “twin blade” radiator grille, with two blade-shaped louvers and stylized “A” positioned underneath – a characteristic feature of AMG vehicles – all complement each other perfectly, along with the front apron’s lower cross strut finished in high-sheen chrome. In addition to the two special chromed twin tailpipes of the AMG sports exhaust system, the characteristic V12 features include the “V12 BITURBO” lettering on the front wings and the AMG 5-spoke light-alloy wheels painted in titanium grey with a high-sheen finish and equipped with 255/35 R 19 and 285/30 R 19 tires on the front and rear respectively. Particular highlights include the electrically adjustable AMG sports seats with single or two-tone upholstery in Exclusive nappa leather, special AMG V12 diamond-design seat upholstery layout and embossed AMG emblems on the seat backrests. The designo roof lining in leather with partial AMG V12 diamond-design stitching, AMG carbon-fiber trim elements and IWC-design analogue clock provide the perfect visual and tactile finishing touches. Thanks to the digital sound processor (DSP), it is also possible to choose between the high-end “reference” studio sound and spacious surround sound. All of the functions are operated using the COMAND system via a special Bang & Olufsen menu. Particular highlights include the illuminated lens tweeters on the dashboard – they help to create the characteristic virtual sound stage in front of the vehicle occupants. High-quality aluminum loudspeaker covers finished in silver chrome with the Bang & Olufsen logo give an indication of the exceptional position enjoyed by this high-end system. The designo range for the SL 65 AMG, available ex-factory, offers a wealth of tailor-made individualization options to cater for practically any requirement. As well as being able to choose between designo magno cashmere white and designo magno allanite grey matt paintwork or designo mocha black and designo graphite metallic paintwork, customers can also opt for an expressive designo zircon red paint finish. There is a range of Exclusive designo leather appointments in eight attractive colors to match these paint finishes – all rounded off perfectly by a choice of designo trim, headlining and seat-belt options. 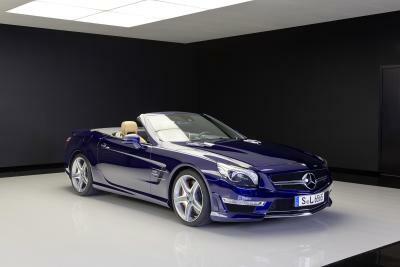 To mark its 45th anniversary, Mercedes-Benz’s high-performance AMG brand is presenting the SL 65 AMG “45th ANNIVERSARY”. Production of the special anniversary model is being limited to just 45 vehicles. The V12 roadster boasts an exclusive array of unusual appointments and design features, such as designo magno graphite matt paintwork, the matt-finish Exterior Carbon-Fiber package, and also AMG 10-spoke forged wheels painted in matt titanium grey with a high-sheen finish on the rim flange. Defining stylistic elements in the interior include upholstery in designo Exclusive STYLE leather in titanium grey pearl/ginger beige with AMG-specific, diamond-design V12 seat upholstery layout featuring, electrically adjustable AMG sports seats with embossed AMG emblems on the seat backrests, AMG trim elements in matt carbon fiber and a badge with the logo “45th ANNIVERSARY – 1 OF 45”.